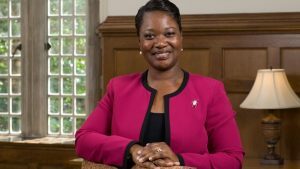 Dr. Jamelle S. Wilson serves as the fifth dean of the University of Richmond School of Professional and Continuing Studies. She succeeds Dr. James L. Narduzzi, Dean Emeritus, who served for 21 years at the helm of the School. Wilson earned a Bachelor of Arts (B.A.) in English and a Master of Teaching (M.T.) from the University of Virginia, a Master of Arts (M.A.) in English, Writing and Rhetoric from Virginia Commonwealth University, and a doctorate (Ed.D.) in Educational Leadership and Policy Studies, also from the University of Virginia. She joins the esteemed group of “Cavalier Spiders” who share influences from both universities. Prior to her appointment as dean, Wilson served as Superintendent of Schools for Hanover County, Virginia. Before being appointed as superintendent, Wilson worked in Hanover County Public Schools as a classroom teacher, a lead teacher, an assistant principal, a principal and an assistant superintendent. Her involvement with the School of Professional and Continuing Studies started through her work on the governance board of Partners in the Arts, Richmond’s premier organization supporting and funding arts integration across the curriculum and a program of the School of Professional and Continuing Studies. Wilson also worked as an adjunct professor in the School’s Educational Leadership and Policy Studies graduate program. Wilson brings to the School a focus on the stories and experiences of everyday working professionals and post-traditional students earning degrees and certificates and working toward professional development and personal enrichment. She also brings her enthusiastic support for the Richmond area and a desire to see the University continue to serve the educational needs of the Richmond community.